1. 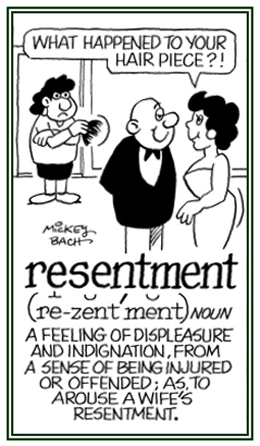 To feel or to show bitterness or indignation because of some act, remark, etc. ; or toward another person, from a sense of being verbally injured or offended: Howard resented the insinuation that he was a coward because he refused to join the military. 2. 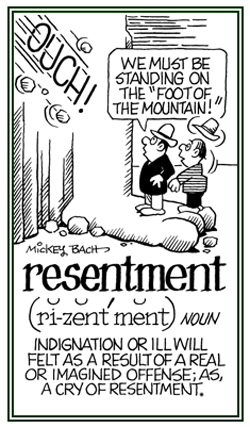 Etymology: from French ressentir, "to be angry"; from Old French resentir, "to feel strongly"; a compound verb from the intensive prefix re- + sentir, "to feel"; which came from Latin sentire, "to feel". Full of deep hostility due to a real or an imagined offense; acrimonious: Jasper's resentful attitude was reflected in his facial expression and by the tone of his voice when he was accused of being a weakling. Pertaining to a feeling of anger or displeasure about someone or something that is considered unfair: With his head held high, Rhett resentfully walked towards the door and slammed it as he left the room after he had been criticized by his mother for coming home so late. A state or condition of being furious, upset, or vehement: As Fran continued to criticize him, Sam's resentfulness increased until he responded by yelling back at her because he couldn't tolerate her constant yelping. An emotional reaction of anger about something that is considered unjustified or wrong: All the confusion at the airport caused considerable resentments among the passengers whose flights were delayed so long or cancelled. © ALL rights are reserved. 1. A particular or distinctive aroma that is typically pleasant: The scent of the pink roses filled the room in the warmth of the evening. 2. A quality that suggests or shows the existence of something: The dogs used by the police followed the scent of the escaped convict. 1. To add or to introduce a particular aroma to a location: In the local restaurant, the fragrance of frying onions was scenting the air in the kitchen and even out into the area where the customers were sitting. 2. Fill with a fragrance: Rosemary used a special perfume to scent her hair. To be without a particular or distinctive odor: Carol prefers to use scentless lotion on her hands so neither she nor anyone else is aware of it. 1. Something that is felt strongly and briefly in the mind or a quick and strong emotion: Samuel had a sensation of having been in the town before. 2. Receiving conscious impressions; such as to hear, see, touch, taste, and smell: The auto accident left Mary's right hand without a sensation or any feeling. The cool breeze caused a strange sensation during the heat of the night. 3. A condition of some lively public interest and excitement: The news about the about the football team winning the championship caused a sensation at the university. Descriptive of or characteristic of that which commands attention, is stunning, or provokes a strong emotional response: The newspaper was famous for its sensational headlines and photographs whenever there was an automobile accident to be reported in the area. The acrobat performed a sensational or extraordinary act at the circus. The use of language that amazes, challenges, and thrills readers or audiences: The speaker's sensationalism during his talk captivated the attention of the people who were attending the presentation. 1. Someone who seeks to draw attention to himself or herself with extravagant, attention grabbing writing: The genre of books described as "bodice rippers" are often written by sensationalists who are appealing to thrill-seeking readers. 2. Anyone who gives too much emphasis to the most shocking and lurid aspects of something: The local newspaper reporter was accused of being a sensationalist who placed too much emphasis on the coverage of the murder trial of the father who murdered his wife and three children. A reference to doing something in a manner that thrills, excites, or arouses an audience or readers: The speaker at the revival spoke in such a sensationally dynamic manner that it caused the members of the congregation to express their feelings by shouting out; "amen", "hallelujah"!. Any of the faculties by which stimuli from outside or inside the body are received and recognized; including, hearing, seeing, smelling, touching, tasting, and balancing; all of which receive impressions through specific bodily organs and the nerves associated with them: The olfactory nerves are used in the sense of smelling; while the sense of touch is considered to be a tactile sense. The bodily senses provide information about one's environment and about the body's internal existence; all of which are collected and transported to the central nervous system including the brain and the spinal cord. Touch: The skin contains nerve endings that send messages to the brain and determine degrees of pressure, cold, warmth, and pain. Taste: The tongue is estimated to contain more than 10,000 taste buds which indicate chemicals in food and drink. A baby is born with taste buds all over its mouth, but they slowly disappear. Taste buds are usually renewed on a weekly basis. Smell: The nose provides smells by sensing chemicals in the air. A person can identify 2,000-4,000 different smells which are processed by the same part of the brain that deals with emotions and memories. Hearing: Sound vibrations trigger a chain of movements in the skull or head. The ears can detect 1,500 different tones, 350 degrees of loudness, and they can gauge the direction of a sound within three degrees. Sight: Light is perceived by the eyes and focused to form images. With normal vision, humans can see a lighted candle 1 mile (1.6 km) away. DK Publishing, Inc.; New York; 1999; page 92. 1. To receive information from one's surroundings through the body's nerves and other physical organs: Sitting quietly by the side of the river, Melony was able to sense the change in the wind and decided she should go home before it started to rain. While Mark was walking home from the bus, he sensed a movement behind him which happened to be his daughter who was trying to catch up with him after getting off a different bus. 2. To detect and to identify a change in something: The store's device at the back senses when the door is opened at night and sounds the alarm. 3. Etymology: from Latin sensus, "feeling, perception"; from sens-, past participle stem of sentire, "to feel".